The color of the body is dark. The body has no scale and is covered with the black film. Another feature is that the head is round and the eyes become in the form of a pipe. This fish has a typical figure like a deep sea fish. 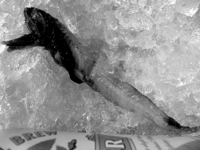 This picture image of the fish becomes bare, but the color of the body is dark. The body is slim long and flat right to left. The mouth can open greatly and this fish has a typical figure like a deep sea fish.